Sumatera, the legendaric 'Land of the Gold' from the ancient times is not the biggest island of Indonesia, it does also not have the biggest population, but most people think it's the island with the most variety. Actually it really offers something to everyone - wealthy rainforests, rivers and fallsm craterlakes, splendid white beaches and a stunning variety in traditional ethnical groups and vulcanic landscapes which belong to the most spectacular in the world. Sumatra, the most western of the very large tropical archipelago is brought to live by vital waterways, almost looks like an entire continent; far streched lowland rainforests and swampy areas are cut by muddy slow moving rivers which sometimes run over the island for almost 800 kilometres before ending in the Chinese South Sea. In contrary to other islands of the size of Sumatera, it's a vulcanic island, the imposing row of vulcanic peaks forms the spline of the island, it contains scattered lakes and fertile high valleys. The island furthermore contains a big variety of natural recources. Coffee, tea, rubber, palmoil, natural gas, oil, cacao, bauxite, coal and tin form 50 per cent of Indonesia's annual income, and the numerous of harbours at the long coastal line give access to the rich maritime live in the surrounding waters. This all is causing an important role to Sumatera in Indonesia's history. The first big kingdom ever in the archipelago, the Buddhist state of Srivijaya, had it's capital at the river Musi, near the nowadays city of Palembang. From here the Malaka Strait and Sunda Strait were ruled for over 300 years. It meanwhile took possession of all other harbours and seaports near it, and had direct contact with the far India and China. The Indian civilization, which should have a far streched cultural influence, reached Indonesia in the second millennium AD through the Sumateran harbours. In the second millennium this repeated when the Islam settles in the northern harbours of the island, to spread over almost every Indonesian island. 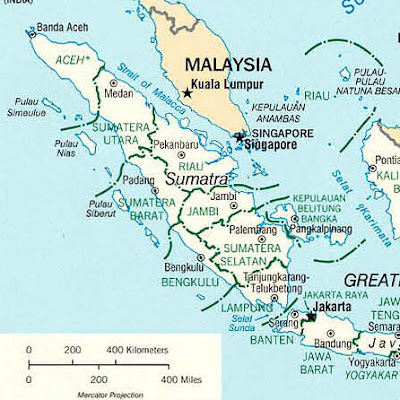 Sumatera was inhabited long before the Indian traders reached the island. More than twelve important ethnical groups lives scattered across the island and spoke 25 different languages and hundreds of local dialects. Different types of population belong to the most dynamic of Indonesia. The Aceh, in the north, for example, are strong Muslems and are known for their strong resistance against the Dutch rule. The Minangkabau from western Sumatera spread all over Indonesia nowadays and belong to the economical elite in most areas. The biggest group of people, the Malay, ruled over the sea traffic in Asia in the booming times. Theyr language forms the base for the national languages of Indonesia and Malaysia. Te Batak from the highlands around Danau Toba (Lake Toba), are the most agressive group of the country. As a place to stay for a holiday, it almost can't get any better. The rainforests offer place for an unknown variety of animals and plants - elephants, tigeers, rhino's and even the world's biggest flower, the bad-smelling Rafflesia - , while the original population are very hospitable and friendly as well. On Sumatera the visitor will find the best of all other Indonesian islands on one spot, at least it is said a lot.